Display your favorite bird feeder or wind chime in a contemporary way with this Circa Chrome Modern Plant Hook. This sleek, 12" long hanger perfectly holds wind chimes or a hummingbird feeder, adding a fun bit of contrast to your garden. The chrome plated steel body ensures a sturdy hanger with bold color, and its shape furthers the modern theme. A center, straight shaft supports two almost circular, 2" diameter ends. A 1" gap in each of these metal circle shapes allows you to place the hanger over a branch of the same size, and these openings face opposite ways for more style. The bright, chrome finish on the item easily reflects sunlight, and the all steel construction is sure to withstand use for many seasons. 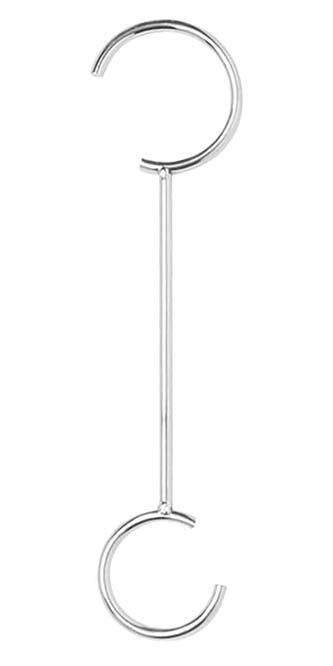 Hang your classic garden adornment from a new support using this Circa Chrome Modern Plant Hook. Availability: 661 in Stock. Ships from OH within 24 business hours , 661 available at this price!